Unless I am warm I am not drawn to cold foods, so in the colder months it can be a challenge to get exited about eating raw vegetables or salads. Unless I am working out or running and my body temperature goes up, me and salad are not usually friends this time of year. So in order to make me want to eat cold things like raw vegetables, it has to be pretty special, texture, taste, all of it. 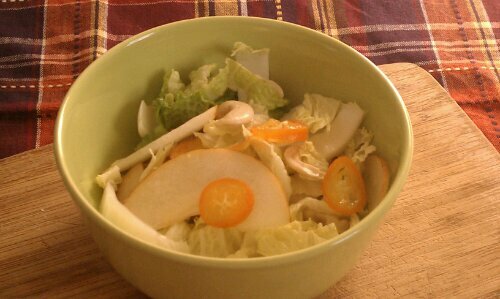 This a little unusual salad combines crunchy Napa Cabbage, citrusy (is that a word, really?) Kumquats and crispy fresh Asian Pears along with cashews into an explosion of flavor without too much of the weight you too often find in rich winter salads. The dressing is simple and light and accentuates the sweetness of the Kumquats with a refreshing lime dressing. If you’ve never tried Kumquats, you’re in for a treat. They are an about pecan sized member of the citrus family, but the whole fruit is edible, including the shell which is not bitter (like in an orange for example). 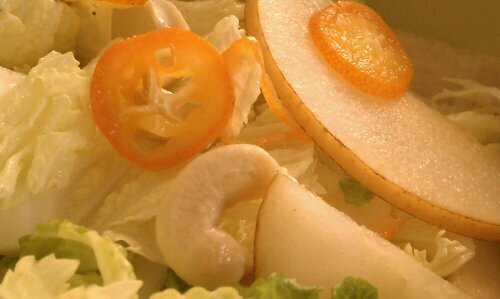 Crispy salad with creamy cashews, yummy! 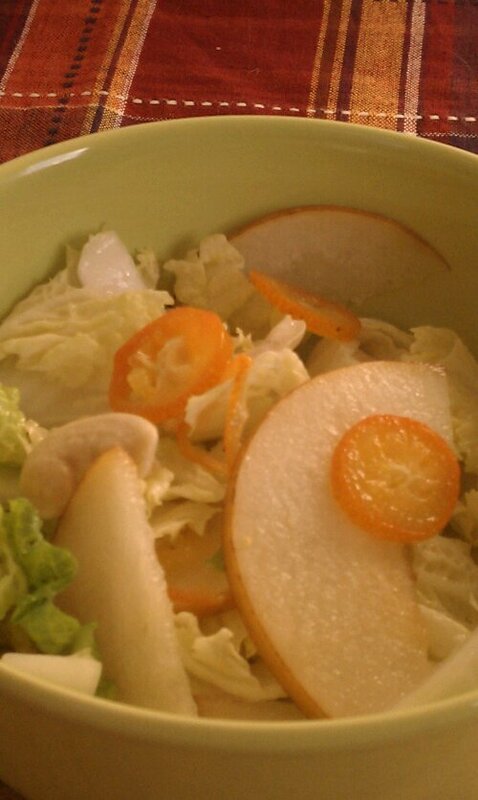 Cut Napa cabbage into 1/2 wide slices. Core and slice Asian pear thinly. Slice kumquats into 1/8″ thick slivers, remove any seeds and reserve Amy juices. 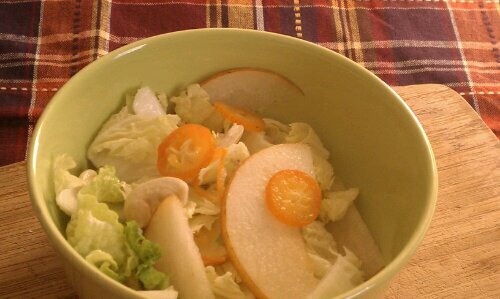 In a large salad bowl, combine Napa, Asian pear, kumquats and juices. Juice the lime into the same bowl. Drizzle the olive oil over top and sprinkle with cashews.